This is the most important steps for our clients. You will not get help if you don't ask for it. Initially, we will have our clients fill out our KRG EVENT CONTACT FORM located to the right. This form will help us get a sense of urgency and seriousness from the clients. The first stage of our research begins here, and you should receive a reply within minutes. After receiving the case request form, one of our investigators will contact the client. At this phase, we will ask any questions we have in regards to the case request form and ask more questions to the people who reside or are employed at the location the activity is occurring at. The important part of this step is being able to talk to the client face to face or over the telephone. From here, if the client is found to be credible and sincere with their request for help, the case will be brought before the Lead Investigator. If the case is accepted, a date will be set up for our investigation. During the location walk through, the investigators will ask the client to point out the areas that activity takes place and what type of activity goes on there. Anything that could provide a conventional explanation for the activity will be considered at this time. 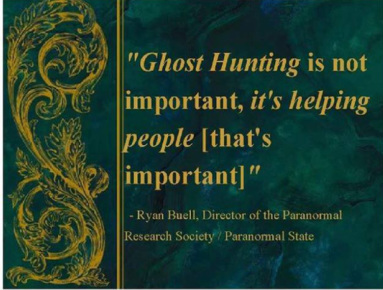 We want to rule out any ordinary causes for activity before looking for a paranormal explanation. The investigators will also take some still pictures and bases readings with some of the equipment. After the walk through is completed, the investigators may need to ask the client a few more questions that will help make the investigation run smooth and efficiently. If there are any other key witnesses, the client should have them present also. Please keep in mind that most of our investigations take place between 10:00pm and 2:00am. This is the best time for us to research without being interrupted. Usually, during this time, everyone is asleep, lights, electronics, and appliances are turned off, and everything is quiet. We start of by setting up the home base and placing our night vision cameras at the predetermined locations. Next, the whole team will be briefed on what each member will be responsible for. Specific details will be withheld to add more credibility towards an investigator's findings, if any. From here, each investigator will take turns gathering readings, taking pictures, shooting video, and trying to witness activity. (See our Equipment page to see what we use throughout the investigation). One team will always remain at the base to monitor and record all activity. The investigation will end when the Lead Investigators feel enough evidence has been gathered. For us, this step is just as exciting as the investigation. Every shred of evidence is looked over. We will review every minute of footage from our video cameras and DVR system, listen to every minute of audio on the voice recorders, examine every still photograph, and look over all notes that were taken during the investigation. Our investigators will also share any personal experiences from the investigation and try to include them with the rest of the evidence obtained. A full four hour investigation will often take triple the amount of time to review. We will usually tell the client to give us about a week or two to review the evidence for as I mentioned, we do have jobs and families. After the review, we will conduct more research into the property and land if needed. From here, the lead investigators will come to the conclusion that the place is either haunted, exhibits paranormal activity, or has no activity at all. After the review, the Lead Investigators will reveal all findings, if any, to the client. Any questions or concerns by either the Client or Investigators will be addressed here. Remember, the final conclusion will be presented without any bias and will be based on physical evidence collected. Personal experiences, though exciting to hear, hold no ground in the paranormal community. This is where our job ends. We will offer any advice that we can to the client and try to lead them in the right direction for any further help, but again, we are not exorcists or priests. If we find that the investigation is inconclusive, but does show signs of activity, either party can request for a continuation. Though our part is done, we will always be accessible to our clients to answer questions or lend support in any way we can.